Like for most people, that day was going to be like any other. It was the second day of third grade for me at Hillside School in my hometown of Allendale, New Jersey. But then it became the saddest day in American history and one that would change the world as we knew it for ever. Here's my account of that day. For some reason, I was really excited for art class that day. Looking back, I'm not sure why considering I'm a very unartistic person but I was. And like most kids in Mrs. Murphy's class, I was just getting back to the grind of school after summer break had commenced. But then the phone rang. My teacher answered and said that my mother was there at the school to take me home and I was going home early. I had no idea why, I was pretty certain I did not have any appointments that day. My sister was similarly confused. We hopped in the car and we asked my mother why were we going home early. She said that my father wanted us home. I'm certain we just shrugged and went along with it. We get back to our house and my mother said to us something along the lines of to not turn on the news. I immediately asked her if I could play Backyard Baseball on the computer and she said sure. As I was playing with the Backyard Kids I then turned on the television to ABC Family, which I knew was not the news. What I did see was ABC News coverage and both of the World Trade Center towers with smoke coming out of both buildings. I did not know what I quickly saw before I immediately changed the channel. I never again saw any sort of footage of the attacks on America that day until I was watching a miniseries on TV Land about the Most Shocking Moments in the History of Television in 2005. The attacks were number one. My father turned away and said he could not watch. I was simply stunned of the footage that was before my eyes. I had known what had happened but I had never seen it. Now it was before my eyes four years later and it was simply shocking. Now later that year in 2001, my family was planning on going to Walt Disney World. With the increased fear of flying in an airplane as well as the extreme security at the airports across the nation, my parents were strongly considering cancelling the trip. But they chose not to and it was not just because my sister and I would have been devastated. They chose to carry on with the trip because if they had chosen to cancel, as my mother put it "They would have won." If there is one thing I hope for the millions of people in this country is to never forget. Never forget what happened on September 11, 2001. 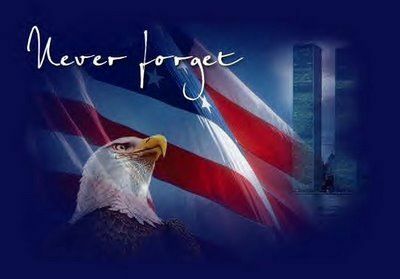 Never forget the lives that were lost on the planes, in the World Trade Center or at the Pentagon. Never forget the heroes aboard United Flight 93 that prevented that hijacked plane from potentially hitting the Capitol Building or the White House. Never forget the heroes that were the first responders at the World Trade Center who gave their lives to save those amidst the rubble. Never forget.